Reflect on the current vogue in zombie material and you find ample demonstration of the extent to which film and television favour a certain number of recurrent elements or motifs. Vampires are another prominent example, which makes two before we even leave the shambling hordes of the un-dead. Broaden those horizons to the world of the living and one cannot but acknowledge the important contributions made by the ever-dependable mob organisation, international terrorist cell, or simple garden-variety psychopath. Entire genres have been built up around archetypes such as these, while for others it must be said that only specific genres afford the conditions necessary for them to function successfully. Zombies, for instance, are unlikely to ever transcend their origins as fodder in B-grade horror fare. Indeed, it is significant that those films which have managed to lead the zombie astray successfully – such as Shaun of the Dead – have been able to do so only through spoofing their typical treatment, rather than truly departing from it. In other words, it's unusual that we find a movie or television show which makes use of zombies as a bit-part. There are no sitcoms – that I'm familiar with, at least – which feature a bunch of hip twenty-somethings and their quirky zombie neighbour. When something features zombies, it's generally going to be en masse, and very much the central concern. Such is not the case with all of film and television's favourite recurrent staples. Aliens, for instance, have managed to ingratiate themselves into virtually every genre, and with great success. Otherworldly life-forms can be found in anything from horror and action/thriller, sitcoms and drama, all the way through to comedy and children's programs. Those not convinced need only look to the box-office records for the month of June 1982, which saw the feel-good alien capers of Steven Spielberg's E.T. : The Extra-Terrestrial rubbing intergalactic shoulders with the tentacled horror of John Carpenter's The Thing. Very few staples of the industry show such versatility. As fate would have it, that same month in 1982 saw one of the few exceptions represented in the form of Blade Runner, a pivotal moment in the cinematic exploration of robots. Like aliens, robots have transcended their original role as a staple of the science-fiction genre to become a popular element in film and television at large. There is no doubt, in either case, that the key to this success lies in their versatility. Just as aliens can look and behave in almost any way conceivable, there is virtually no limit to the possible forms or functions that might dictate the role played by some mechanical creation, not merely in a practical sense, but in terms of tone and narrative role as well. Compare Fritz Lang's Metropolis with the likes of The Jetsons, or again with Transformers and already you see the wide range of potential uses. Where these two phenomena differ, however, is in the proliferation of sub-types and techno-jargon. For unlike an alien organism, which is a fairly simple and all-encompassing concept, the technical nature of robotics has come to be reflected in a highly nuanced field of nomenclature. How does an android differ to a cyborg? Does a powered exoskeleton qualify as a robot? Where do the boundaries occur between something engineered mechanically and an organic equivalent? This article hopes to shed some light on these issues, offering a compromise between pragmatic definitions and practical ones.
. : Mechanoid : . An umbrella term, under which any of the following may be categorised in some capacity. The only qualifying element is that a mechanoid must resemble a machine in either function or design. This permits the inclusion of borderline examples such as puppets, clockwork pieces, and others which bear a semblance of mechanical automation without functioning as an autonomous unit, or that do so with the aid of mystical, spiritual, or other non-scientific forces. Beyond these examples, the vague definition of something being machine-like without, in fact, being a machine renders the term too broad for the interests of discerning one type from another. A classification of last resort.
. : Mech / Mecha : . 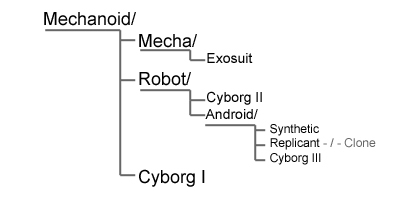 While there is no reason to differentiate the term from 'mechanoid' on an etymological basis, this abbreviated form has come to denote a specific class of robotic entity which falls outside the definition of a robot proper. In brief, the defining characteristic of a mech is the presence of a pilot or operator, without whom the unit loses much, if not all, of its functionality. As a staple of the Japanese anime culture, mecha are usually portrayed as an extension of modern military vehicles, such as tanks and aircraft, or construction equipment, such as loaders and excavators. Due to the necessity of physically enclosing the pilot, mecha have a reputation for being extremely large, and often resemble a greatly exaggerated anthropomorphic form. Neither of these characteristics have a defining role, however, as the operator is not necessarily human, nor is it requisite that the mech must resemble the operator's actual physiology.
. : Exosuit : . While it is a point of some contention, the exosuit is perhaps best understood as a sub-class of mech, all of whose defining characteristics it shares, in addition to some more stringent ones. As with mecha, an exosuit is primarily defined by the need for an independent operator. What distinguishes one from the other is the nature of the interface between operator and unit. A mech may be controlled in a variety of ways, ranging from the traditional mode of piloting, through to virtual or direct neural connection, or even remote control. An exosuit, on the other hand, is controlled via a system of direct physical interaction, as the unit both mimics and enhances the operator's natural motion. For this reason exosuits are necessarily closer in shape, scale, and proportion to their operators, giving the sense that they are 'worn' rather than piloted. As with mecha, the application of this technology tends to be directed toward military use, as powered armour, or manual labour and construction.
. : Robot : . More restricted in the scope of application than 'mechanoid', the term 'robot' is nevertheless the most widely disseminated of any on this list, and thus the most difficult to accurately define. Indeed, the all-encompassing nature of the term has contributed much to the dilemma, largely by popularising a tradition of misapplication. Foremost among these is the practise of labelling things 'robots' when they are in fact merely robotic, meaning robot-like. The key to resolving this hinges on the issue of autonomy, of which there are two crucial factors. First of all, in order to qualify as 'a robot', the unit in question must be able to perform its designated function in isolation. This is not to say that it must be either physically disconnected and/or mobile, simply that it comprises a single complete unit, capable of fulfilling its intended function without external assistance. The welding arm on a production line is thus robotic, rather than a robot, because it is merely part of a much larger functioning machine. On the other hand, an automatic gun-turret mounted on a ship may be considered a robot if it is able to fulfil the demands of target acquisition, calibration, firing and reloading entirely on its own, for in so doing in completes an entire function. This brings us to the second factor, which is autonomy not in a mere physical sense, but in terms of self-maintenance. To put it simply, a robot must be able to perform to its maximum capacity without constant external direction. This may range from the most basic on-board programming all the way through to possessing a fully artificial intelligence: from simple self-propulsion through to sentience and actual self-determination. For this reason a mech is deemed to be robotic rather than a true robot. Beyond these characteristics there is no effective limit on how a robot may be manifested, either in size, shape, materials, or configuration.
. : Android : . A sub-class of robot, defined by their emulation of the human form. While the Ancient Greek word from which it derives is masculine, the term 'android' is used to encompass humankind as a whole, irrespective of gender. The roles and functions of androids are many and varied, although the added trouble of making the unit resemble the human form is generally attributed to the necessity of being emotionally engaging to the humans around them. As such, they tend not to be designed for manual labour or other functions where brute force may be better served by another, abstract form. It is also important to remember that the imprecise nature of the term – designating something man-like – is open to some degree of interpretation. Any semblance of the human form is quite often little more than a matter of the proportion and arrangement of limbs and sensory inputs, while other features, such as materials, external finish, and facial details are either stylised or ignored completely. There is also a grey area concerning the point at which an anthropomorphically proportioned robot is no longer considered an android simply on the matter of scale.
. : Synthetic : . A sub-class of android, defined by their emulation of not only the human form, but also the organic and mechanical operations of human biology. Essentially, synthetics represent analogues of the human body constructed of non-biological materials. While this necessarily results in them bearing a far closer resemblance to human beings than some of the general android class, it is important to bear in mind that synthetics are not typically designed to masquerade as humans, although they can sometimes be put to this use. Instead, their resemblance to biological organisms seems to be based on the design philosophy that the human body is itself one of the most functional of all machines, and is therefore a proven template from which to copy. For this reason, synthetics possess the artificial equivalent of internal organs, circulatory and metabolic systems, and tissues of a similar texture to those of humans as necessary parts of their inherent operation. Other rudimentary details, such as the colour of circulatory fluid, generally exhibit no attempt to pass the units off as human.
. : Replicant : . A sub-class of android, defined by their emulation not only of the human form, but of molecular human biology, rendering them effectively indistinguishable from natural human beings. While the term 'replicant' itself is rarely used outside of its original context in the film Blade Runner, there are sufficient examples shown in other material to warrant their place as a parallel class to that of synthetics. Rather than being an artificial analogue of human biology, replicants are consciously intended to mimic human beings all the way down to a microscopic level. What physical engineering their creation entails is performed on a genetic level, with the subsequent manufacturing process being virtually identical to organic growth. As such, replicants occupy a grey area that verges onto other technology, most notably cloning. The crucial distinction between the two typically hinges on a combination of psychological inadequacy – with replicants lacking some basic elements of the human empathic response – and an inability to procreate. Like some clones, however, replicants often show greatly enhanced physical abilities, and are often unaware of their own artificial status.
. : Gynoid : . Strictly speaking, nothing more than the female equivalent of an android. As the term 'android' has moved away from its gender-specific notion, however, and shifted toward a definition of 'man' as in 'mankind', the term 'gynoid' has accrued its own alternative meaning, namely as a byword for an android whose primary function is to operate as a sexual surrogate. Given the disproportionate representation of female robots intended for this function, as opposed to male ones, it is easy to understand how this etymological shift could have occurred. While this casts a dubious light over the attitudes toward gender which allowed such a shift to occur, the designation is nevertheless useful in itself, so long as we match the inclusive nature of the word android and include male sexual surrogates within the sub-class of gynoids too. It is significant, however, that I cannot think of a single example of a male android whose sole or primary function was to be a sexual surrogate, let alone for use by a female.
. : Cyborg : .
. : Type I - An organism bearing some degree of artificial augmentation. This is the most common definition, and is generally based on the projection of prosthetic technology to a point where it is equal or superior to natural human abilities. The proportion of cybernetic to organic material can range from something as simple as a replacement arm all the way through to an entire body housing an organic brain. Indeed, the only qualification is that the defining characteristic of the individual must be maintained, the core of which is the elusive component commonly known as the psyche.
. : Type II - A robotic species that bears all the hallmarks of organic life. This variation is perhaps the least common, and derives from a liberal interpretation of the term 'organism'. This requires that the unit in question not only present mechanical analogues for the organic processes of consuming matter or energy in order to maintain their autonomy, but also be able to perpetuate their own kind through some form of inherent procreation. This does not include the ability to simply produce a copy by making use of a typical production line. As such, this variety of cyborg occupies a grey area between robots and an alien species which just happens to be composed of what we recognise as machinery.
. : Type III - An android whose physical construction incorporates some percentage of organic componentry. This is not an entirely satisfactory definition in most cases, but is worth addressing for the number of sources where it is openly avouched. The most prominent example is encountered in The Terminator, where Kyle Reese refers to the T-800 unit as a cyborg, based on the fact that its metallic endoskeleton is housed within organic tissues in order to aid infiltration. The problem with this interpretation is that, while the flesh is undeniably alive in a molecular sense, the same cannot be said for the unit as a whole. Unlike Type I cyborgs there is no continuity from an original organic state, and unlike Type II it fits none of the necessary criteria to be considered a living organism. The issue is effectively sealed later in the film when we see the T-800 able to function perfectly well, albeit without the ability to infiltrate, once all the organic material has been burnt off. As such, it is actually nothing more than a robot encased in a living sheath, the properties of which are advantageous to, but not essential to its functionality. So there you have it, a hierarchical guide to the complex and fascinating world of artificial entities. And while I have touched on a number of particularly illustrative examples, there are many more popular and imaginative examples out there. So what are some of your favourites, and how would you categorise them according to this hierarchy? Have your say in the comment section below.